Bivalent linkers derived from compounds of formulae (V), (VI), and (VII), where X1 and X2 are leaving groups and the other variables are as defined in the claims, to be included in or for preparing vitamin, drug, diagnostic agent, and/or imaging agent conjugates are described. This application claims the priority benefit under 35 U.S.C. § 119(e) of U.S. provisional patent application Ser. No. 60/590,580, filed Jul. 23, 2004, the disclosure of which is incorporated herein in its entirety by reference. This invention pertains to bivalent linkers, and the synthesis and use thereof. 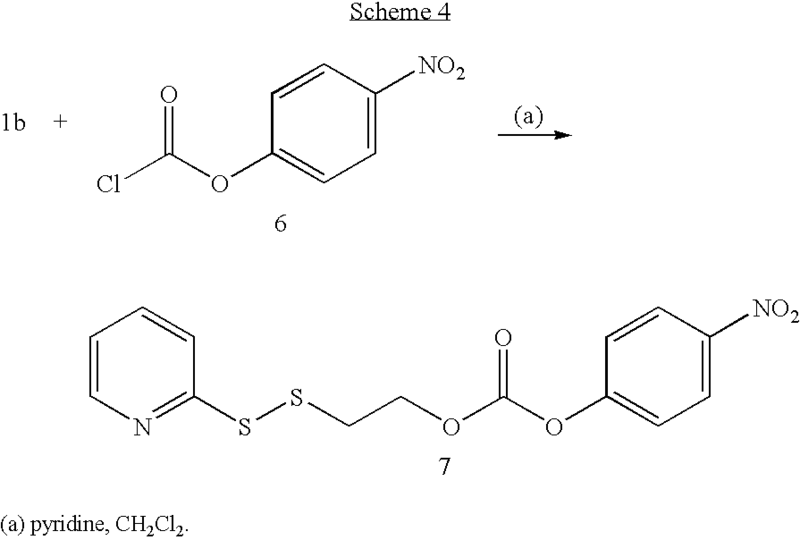 In particular, this invention pertains to the synthesis and use of bivalent linkers in preparing vitamin, drug, diagnostic agent, and/or imaging agent conjugates. Drug, vitamin, diagnostic, and imaging agent conjugates have been used to treat, diagnose, and evaluate various disease states in humans and in animals. In many cases these drug, vitamin, diagnostic, and imaging agent conjugates include intervening linkers separating for example a targeting ligand from a drug, diagnostic agent, or imaging agent. These linkers include a wide variety of bivalent fragments that may be used separately or when linked together for inclusion in conjugates to for example space a drug, diagnostic agent, or imaging apart from other parts of the conjugate, such as for example a vitamin or other targeting ligand. These linkers may also be stable to the metabolic, physiological, or biological conditions present when they are administered to humans and animals, or alternatively these linkers may undergo various routes of cleavage and/or fragmentation under such conditions. There exists a continuing need for bivalent linkers that can be generally used in drug, vitamin, diagnostic, and imaging agent conjugates. Illustratively, the present invention includes divalent linkers, which are alternatively referred to as bivalent linkers, that may be used to couple, link, bond, attach, or otherwise associate two or more chemical entities. This coupling, linking, attachment, or association may be used in the formation of conjugates of such chemical entities. Those chemical entities include targeting ligands and receptor-binding ligands, such as vitamins. Those chemical entities also include drugs for treating various diseases or disease states, and imaging and diagnostic agents for diagnosing, detecting, or otherwise monitoring various diseases or disease states. In one embodiment, one chemical entity includes a vitamin receptor-binding moiety, and another entity includes a drug, imaging agent, diagnostic agent, another bivalent linker, or another bivalent linker conjugated with a drug, imaging agent, diagnostic agent. It is appreciated that multiple linkers may be used between the two or more chemical entities to change the distance between the two entities and/or to change the physicochemical properties of the conjugates prepared therefrom. In another embodiment, a compound is described that includes a first leaving group that is displaceable by a first nucleophile, a linker region, and a second leaving group that is displaceable by a second nucleophile, wherein the first nucleophile is a vitamin receptor-binding moiety, and the linker region comprises one or more bivalent linker units, which may be the same or different, and the second nucleophile is a drug, imaging agent, diagnostic agent, or another bivalent linker. wherein n is an integer from 1 to about 4; Ra and Rb are each independently selected from the group consisting of hydrogen and alkyl, including lower alkyl such as C1-C4 alkyl that are optionally branched; or Ra and Rb are taken together with the attached carbon atom to form a carbocyclic ring; and X1 and X2 are each independently selected leaving groups. In one aspect, each of the independently selected leaving groups X1 and X2 are displaceable by a nucleophile, such as a drug, a vitamin, an imaging agent, a diagnostic agent, or another bivalent linker nucleophile, and the like. In another embodiment, a conjugate is formed from the compound of formula (V) by displacing one or more of the leaving groups X1 and X2 with a nucleophile, such as a drug, a vitamin, an imaging agent, a diagnostic agent, or another bivalent linker nucleophile, and the like. wherein m is an integer from 1 to about 4; and X1 and X2 are each independently selected leaving groups. In one aspect, each of the independently selected leaving groups X1 and X2 is displaceable by a nucleophile, such as a drug, a vitamin, an imaging agent, a diagnostic agent, or another bivalent linker nucleophile, and the like. In another embodiment, a conjugate is formed from the compound of formula (VI) by displacing one or more of the leaving groups X1 and X2 with a nucleophile, such as a drug, a vitamin, an imaging agent, a diagnostic agent, or another bivalent linker nucleophile, and the like. In another embodiment, a conjugate is formed from the compound of formula (VII) by displacing one or more of the leaving groups X1 and X2 with a nucleophile, such as a drug, a vitamin, an imaging agent, a diagnostic agent, or another bivalent linker nucleophile, and the like. wherein n is an integer from 1 to about 4; Ra and Rb are each independently selected from the group consisting of hydrogen and alkyl, including lower alkyl such as C1-C4 alkyl that are optionally branched; or Ra and Rb are taken together with the attached carbon atom to form a carbocyclic ring; X1 and X2 are each independently selected leaving groups; and L1 and L2 are each independently selected bivalent linkers. wherein m is an integer from 1 to about 4; X1 and X2 are each independently selected leaving groups; and L1 and L2 are each independently selected bivalent linkers. FIG. 3 shows the 1H NMR spectrum of Example 4, compound 12. 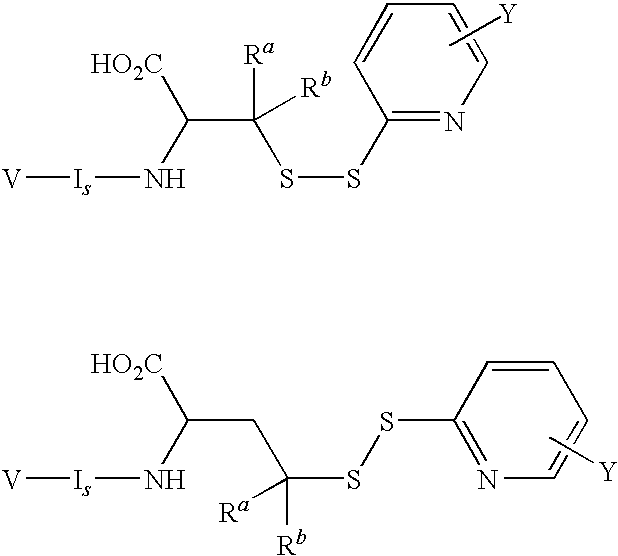 Bivalent linkers for use in conjugates or for use in preparing conjugates are described herein. The bivalent linkers may be used to prepare drug conjugates, imaging agent conjugates, and/or diagnostic agent conjugates. Drug conjugates include targeting agent conjugates, such as the vitamin receptor-binding drug conjugates as described in U.S. Patent Application Publication No. 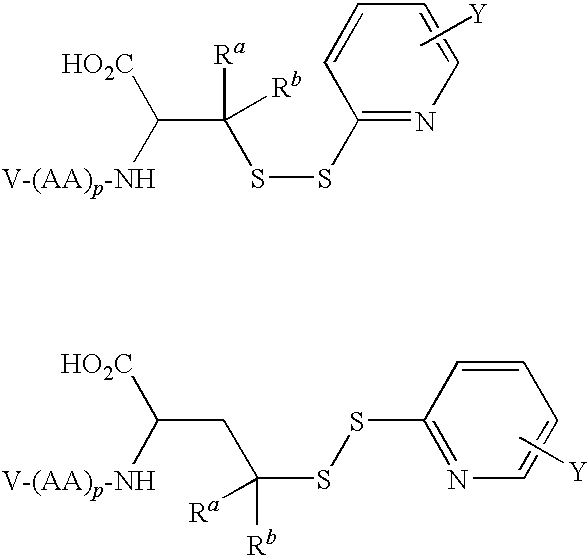 US-2005-0002942-A1, and other drug conjugates described in U.S. Patent Application Publications Nos. US-2001-0031252-A1 and US-2003-0086900-A1. Imaging agent conjugates and diagnostic agent conjugates include those described in U.S. Patent Application Publication No. US-2004-0033195-A1 and International Patent Application Publication No. WO 03/097647. The disclosures of each of the foregoing patent application publications are incorporated herein by reference. 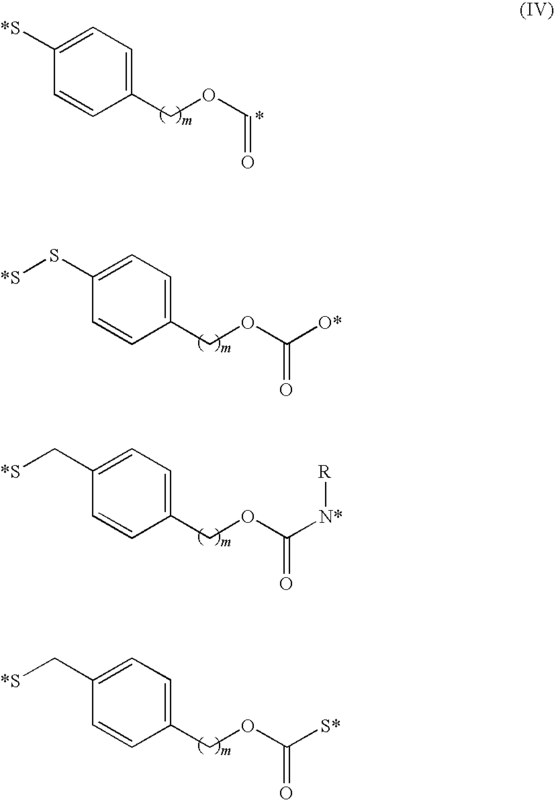 It is appreciated that conjugates of analogs and derivatives of drugs, conjugates of analogs and derivatives of vitamins, conjugates of analogs and derivatives of imaging agents, and conjugates of analogs and derivatives of diagnostic agents may be prepared using the bivalent linkers described herein. Further, unless otherwise indicated, the term drug should be understood to include analogs and derivatives thereof, the term vitamin should be understood to include analogs and derivatives thereof, the term imaging agent should be understood to include analogs and derivatives thereof, and the term diagnostic agent should be understood to include analogs and derivatives thereof. The bivalent linkers described herein may be used as spacers to alter the overall distance from the drug, vitamin, imaging agent, or diagnostic agent and the moiety to which it is conjugated. 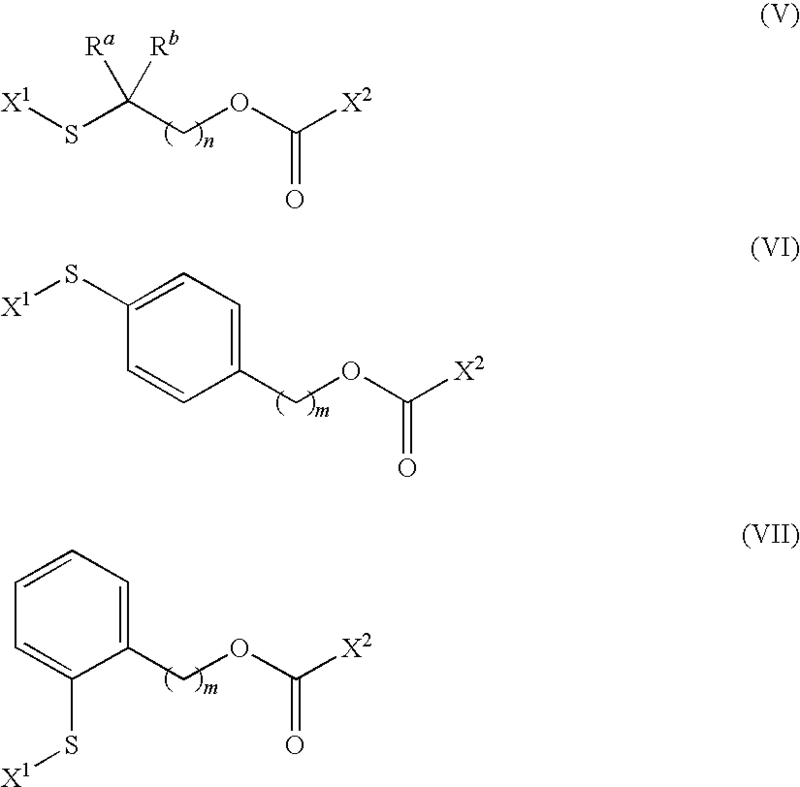 Further, the bivalent linkers described herein may be used to alter the physicochemical properties, solubility properties, and other properties of the drug, vitamin, imaging agent, or diagnostic agent conjugates in which they are included. 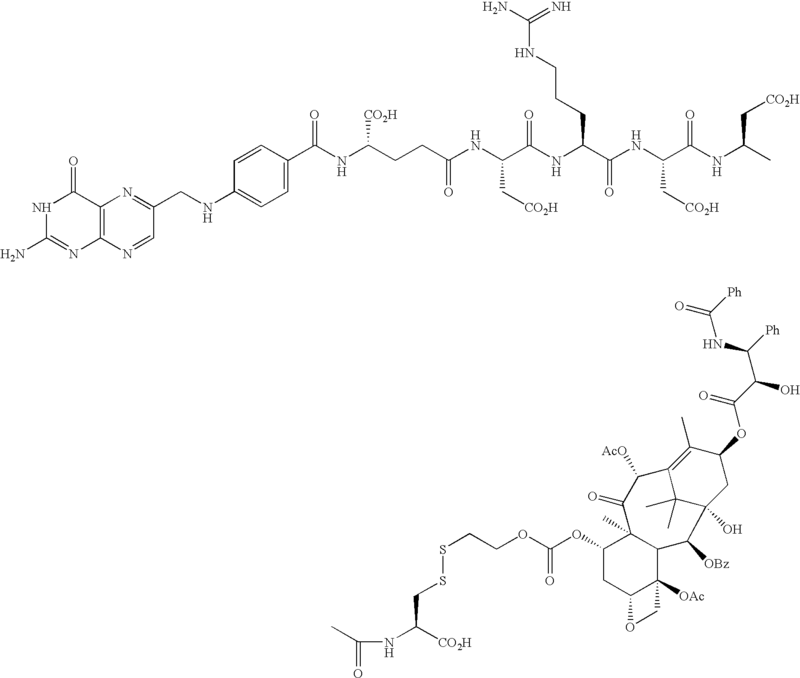 where V is a vitamin receptor-binding moiety, including analogs or derivatives thereof, L is a linker, D is a drug, including analogs or derivatives thereof, IA is an imaging agent, including analogs or derivatives thereof, and DA is a diagnostic agent, including analogs or derivatives thereof. Linker (L) can comprise multiple bivalent linkers, including the bivalent linkers described herein. where n is an integer selected from 1 to about 4; Ra and Rb are each independently selected from the group consisting of hydrogen and alkyl, including lower alkyl such as C1-C4 alkyl that are optionally branched; or Ra and Rb are taken together with the attached carbon atom to form a carbocyclic ring; R is an optionally substituted alkyl group, an optionally substituted acyl group, or a suitably selected nitrogen protecting group; and (*) indicates points of attachment for the drug, vitamin, imaging agent, diagnostic agent, other bivalent linkers, or other parts of the conjugate. 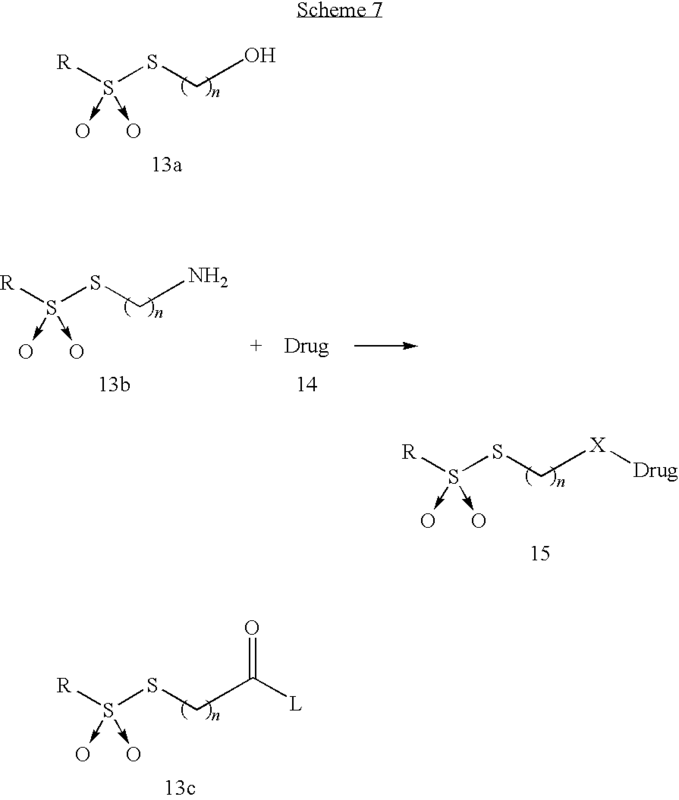 where m is an integer selected from 1 to about 4; R is an optionally substituted alkyl group, an optionally substituted acyl group, or a suitably selected nitrogen protecting group; and (*) indicates points of attachment for the drug, vitamin, imaging agent, diagnostic agent, other bivalent linkers, or other parts of the conjugate. wherein n and m are each independently selected integers from 1 to about 4; Ra and Rb are each independently selected from the group consisting of hydrogen and alkyl, including lower alkyl such as C1-C4 alkyl that are optionally branched; or Ra and Rb are taken together with the attached carbon atom to form a carbocyclic ring; and X1 and X2 are each independently selected leaving groups that may be nucleophilically displaced by a drug, vitamin, imaging agent, diagnostic agent, another bivalent linker, or another part of the conjugate. where V, D, and n are as described herein; n is an integer from 1 to about 4; Ra and Rb are each independently selected from the group consisting of hydrogen and alkyl, including lower alkyl such as C1-C4 alkyl that are optionally branched; or Ra and Rb are taken together with the attached carbon atom to form a carbocyclic ring; and L1 and L2 are each independently selected bivalent linkers used to prepare the conjugates. Similarly, it is understood that the vitamin-imaging agent and vitamin-diagnostic agent conjugates corresponding to the formulae (VIII) may also be formed from the bivalent linkers described herein. where V, D, and n are as described herein; m is an integer from 1 to about 4; and L1 and L2 are each independently selected bivalent linkers used to complete the conjugates. Similarly, it is understood that the vitamin-imaging agent and vitamin-diagnostic agent conjugates corresponding to the formulae (IX) may also be formed from the bivalent linkers described herein. where V, D, and n are as described herein; m is an integer from 1 to about 4; and L1 and L2 are each independently selected bivalent linkers used to complete the conjugates. Similarly, it is understood that the vitamin-imaging agent and vitamin-diagnostic agent conjugates corresponding to the formulae (X) may also be formed from the bivalent linkers described herein. It is to be further understood that when any of V, L2, and/or D is connected to the carbonyl group of the bivalent linkers described herein, such as the bivalent linkers of formulae (VIII), (IX), and/or (X), the connection is made through a heteroatom, such as an oxygen, sulfur, optionally substituted nitrogen, and the like. where V, D, L1, L2, X1, and X2 are as described herein; and n is an integer from 1 to about 4. Similarly, it is understood that the vitamin-imaging agent and vitamin-diagnostic agent conjugates corresponding to the formulae (XI) may also be formed from the bivalent linkers described herein. where V, D, L1, L2, X1, and X2 are as described herein; and m is an integer from 1 to about 4. Similarly, it is understood that the vitamin-imaging agent and vitamin-diagnostic agent conjugates corresponding to the formulae (XII) may also be formed from the bivalent linkers described herein. where V, D, L1, L2, X1, and X2 are as described herein; and m is an integer from 1 to about 4. Similarly, it is understood that the vitamin-imaging agent and vitamin-diagnostic agent conjugates corresponding to the formulae (XIII) may also be formed from the bivalent linkers described herein. It is further understood that when any of V, L2, and/or D is connected to the carbonyl group of the bivalent linkers described herein, such as the bivalent linkers of formulae (XI), (XII), and (XIII), the connection is made through a heteroatom, such as an oxygen, sulfur, optionally substituted nitrogen, and the like. In one illustrative embodiment, the leaving group X1 is an arylthio group. In one aspect, the arylthio group is an heteroarylthio group and includes, but is not limited to, optionally substituted 2-pyridinylthio, optionally substituted 4-pyridinylthio, and the like. In another illustrative aspect, the substitutions include electron withdrawing substituents, such as cyano, nitro, alkylsulfonyl, arylsulfonyl, halo, haloalkyl, acyl and derivatives thereof, carboxyl and derivatives thereof, and the like, and combinations thereof. In another illustrative embodiment, the leaving group X2 is an aryloxy group. In one aspect, the aryloxy group is an optionally substituted phenyl group. In another illustrative aspect, the aryloxy group is an optionally substituted heteroaryloxy group and includes, but is not limited to, optionally substituted benzotriazoles, and the like. In another illustrative aspect, the substitutions include electron withdrawing substituents, such as cyano, nitro, alkylsulfonyl, arylsulfonyl, halo, haloalkyl, acyl and derivatives thereof, carboxyl and derivatives thereof, and the like, and combinations thereof. where R is alkyl or aryl, each of which may be optionally substituted, such as with halo, alkyl, haloalkyl, alkoxy, haloalkoxy, cyano, nitro, and the like; and where (*) indicates the point of attachment to the sulfur of the bivalent linkers described herein. 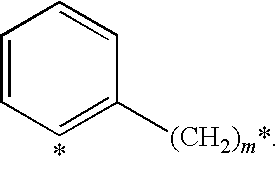 where (*) indicates the point of attachment to the carbonyl of the bivalent linkers described herein. In one aspect, each of the leaving groups X2 having the formulae (XV) may be optionally substituted with one or more substituents, or additional substituents, selected from halo, alkyl, haloalkyl, alkoxy, haloalkoxy, cyano, nitro, and the like. Bivalent linkers that include leaving groups such as those shown in formulae XIII, XIV, and XV may be prepared following the corresponding synthetic procedures described in the Examples described herein. or a protected derivative thereof, where Ra and Rb are each independently selected from the group consisting of hydrogen and alkyl, including lower alkyl such as C1-C4 alkyl that are optionally branched; or Ra and Rb are taken together with the attached carbon atom to form a carbocyclic ring; Y is hydrogen or a substituent, illustratively an electron withdrawing substituent, including but not limited to nitro, cyano, halo, alkylsulfonyl, a carboxylic acid derivative, and the like; ls is either a bond or another bivalent linker; and where V is as defined herein. It is appreciated that other substituents may be optionally present on the cysteine or homocysteine portion of these drug delivery conjugates, such as longer and/or branched alkyl groups, alkoxy groups, alkoxyalkyl groups, and the like. It is to be understood that cyclic variants of the cysteine portion of these drug delivery conjugates are contemplated. In one aspect, Ra is hydrogen, and Rb is alkyl, such as methyl. 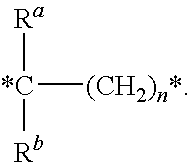 In another aspect, both Ra and Rb are alkyl, either the same or different, such as both being methyl. In another aspect, Ra and Rb are taken together with attached carbon to form a spiro cyclopropyl. where R is hydrogen, alkyl, acyl, or a suitable nitrogen protecting group, R′ and R″ are hydrogen or a substituent, each of which is independently selected in each occurrence, and q is an integer such as 1, 2, 3, 4, or 5. 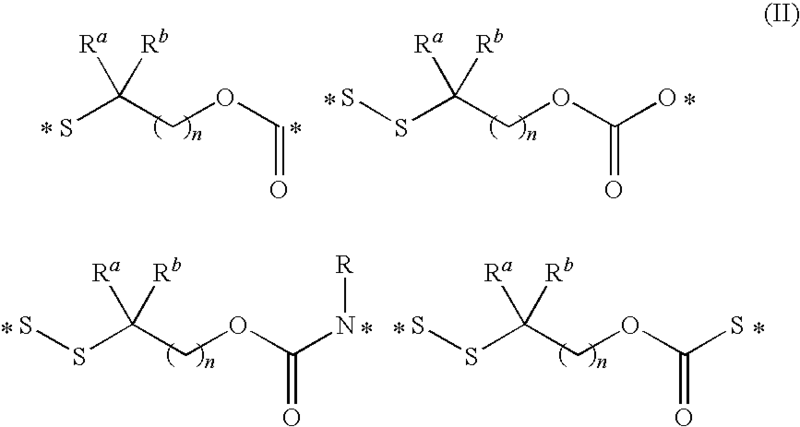 Illustratively, R′ and/or R″ independently correspond to, but are not limited to, hydrogen or the side chains present on naturally occurring amino acids, such as methyl, benzyl, hydroxymethyl, thiomethyl, carboxyl, carboxylmethyl, guanidinopropyl, and the like, and derivatives and protected derivatives thereof. The above described formula includes all stereoisomeric variations. For example, the amino acid may be selected from asparagine, aspartic acid, cysteine, glutamic acid, lysine, glutamine, arginine, serine, ornitine, threonine, and the like. In another illustrative aspect of the vitamin receptor binding drug delivery conjugate intermediate described herein, the drug, or an analog or a derivative thereof, includes an alkylthiol nucleophile. It is appreciated that the bivalent linkers described herein may undergo cleavage under certain chemical, environmental, or physiological conditions. In particular, the bivalent linkers described herein may undergo cleavage under physiological conditions, such as by the action of a glutathione mediated mechanism. In such embodiments, those linkers may be alternatively referred to as releasable linkers. 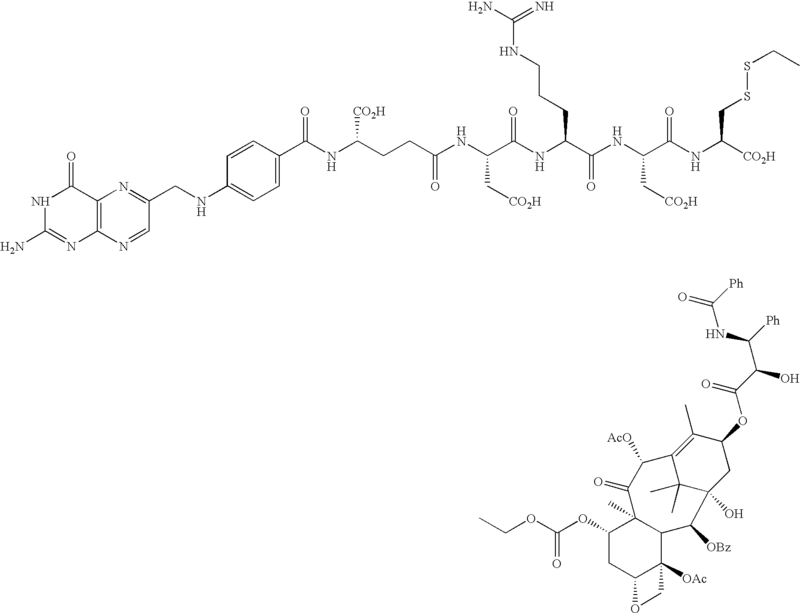 where X is an exogenous or endogenous nucleophile, glutathione, or bioreducing agent, and the like, and either of Z or Z′ is the vitamin, or analog or derivative thereof, or the drug, or analog or derivative thereof, or a vitamin or drug moiety in conjunction with other portions of the bivalent linker. It is to be understood that although the above fragmentation mechanisms are depicted as concerted mechanisms, any number of discrete steps may take place to effect the ultimate fragmentation of the bivalent linker to the final products shown. For example, it is appreciated that the bond cleavage may also occur by acid catalyzed elimination of the carbamate moiety, which may be anchimerically assisted by the stabilization provided by either the aryl group of the beta sulfur or disulfide illustrated in the above examples. In those variations of this embodiment, the releasable linker is the carbamate moiety. Alternatively, the fragmentation may be initiated by a nucleophilic attack on the disulfide group, causing cleavage to form a thiolate. The thiolate may intermolecularly displace a carbonic acid or carbamic acid moiety and form the corresponding thiacyclopropane. In the case of the benzyl-containing bivalent linkers, following an illustrative breaking of the disulfide bond, the resulting phenyl thiolate may further fragment to release a carbonic acid or carbamic acid moiety by forming a resonance stabilized intermediate. In any of these cases, the releaseable nature of the illustrative bivalent linkers described herein may be realized by whatever mechanism may be relevant to the chemical, metabolic, physiological, or biological conditions present. Disulfide groups can be generally formed by reacting an alkyl or aryl sulfonylthioalkyl derivative, or the corresponding heteroaryldithioalkyl derivative such as a pyridin-2-yldithioalkyl derivative, and the like, with an alkylenethiol derivative, as illustrated in Scheme 1. Solvents that can be used for this reaction include THF, EtOAc, CH2Cl2, CHCl3, CCl4, DMF, DMSO, and the like. The temperature range employed in this transformation may vary between 0° C. and 80° C. The required alkyl or aryl sulfonylthioalkyl derivative may be prepared using art-recognized protocols, and also according to the method of Ranasinghe and Fuchs, Synth. Commun. 18(3), 227-32 (1988), the disclosure of which is incorporated herein by reference. 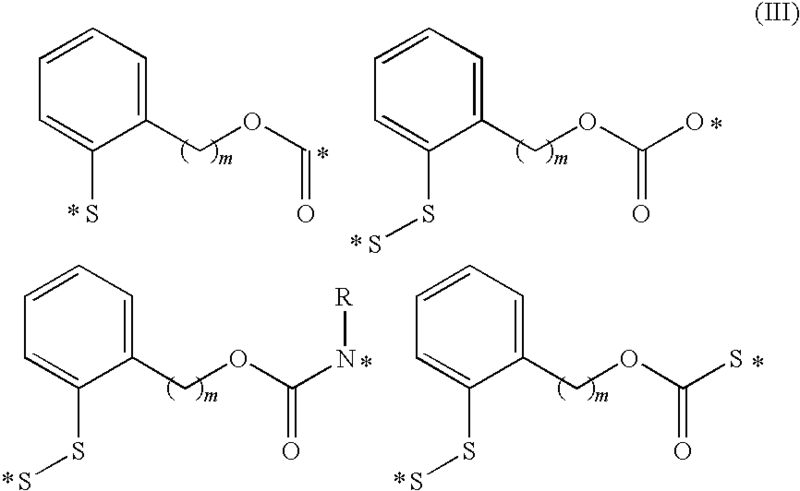 Other methods of preparing unsymmetrical dialkyl disulfides are based on a transthiolation of unsymmetrical heteroaryl-alkyl disulfides, such as 2-thiopyridinyl, 3-nitro-2-thiopyridinyl, and like disulfides, with alkyl thiol, as described in WO 88/01622, European Patent Application No. 0116208A1, and U.S. Pat. No. 4,691,024, the disclosures of which are incorporated herein by reference. Carbonates, thiocarbonates, and carbamates can generally be formed by reacting an hydroxy-substituted compound, a thio-substituted compound, or an amine-substituted compound, respectively, with an activated alkoxycarbonyl derivative where X is a suitable leaving group, as illustrated in Scheme 2.
where Q is oxygen, sulfur, optionally substituted nitrogen, optionally protected nitrogen, and the like. Solvents that can be used for this reaction include THF, EtOAc, CH2Cl2, CHCl3, CCl4, DMF, DMSO, and the like. The temperature range employed in this transformation may vary between 0° C. and 80° C. Any basic catalyst such as an inorganic base, an amine base, a polymer bound base, and the like can be used to facilitate the reaction. Example 1 was prepared according to Scheme 3. (a) 4-dimethylaminopyridine (DMAP), CH2Cl2; (b) Et2O; (c) CH3CH. Step (a). A solution of 4-(dimethylamine)pyridine (3.0 g; 24.68 mmol; 1.03 eqs.) in 10 mL anhydrous methanol was added to a suspension of 2-(2-pyridyldithio)ethanol hydrochloride (compound (1a); C7H9NS2O.HCl; 5.4 g; 24 mmol) in 10 ml of anhydrous methanol, and the mixture was stirred to form a clear solution. Within a few minutes, the solution turned turbid with the formation of a fine suspension, and this suspension was purified by flash chromatography (FC). FC was performed by using 140 g silica gel 60 with 5% methanol in CH2Cl2 to form a 24 cm×4.3 cm silica gel bed with 500 ml solvent reservoir. The said suspension in 20 mL CH2Cl2 was loaded and the column was eluted with 5% methanol in CH2Cl2 with standard collection of 30 mL fractions coupled with UV-detection. The product compound (1b) can be detected from fraction 2 to 9 by TLC (1:1 Hexane:EtOAc). Step (b). 1-Hydroxy-6-(trifluoromethyl)benzotriazole (compound (2); C7H4F3N3O; 2.3 g; 0.11 mol; Aldrich) was dissolved in 770 mL ether and the supernatant was decanted into a 2 L RB flask Trichloromethyl chloroformate (compound (3); C2Cl4O2; 107 g; 0.053 mol; 6.0 mL) was added into this clean colorless solution at room temperature over a 15 minutes period. The mixture was gently heated to temperature between 40-50° C. for 1 hour, and cooled to room temperature. The solution was filtered, and the precipitate was washed with ether (10×30 mL). The precipitate was a white powder and was dried with vacuum and gave 16.95 g (74% yield). Additional synthetic details are described by Ogura et al, in Synthesis, 1987, 557-560, the disclosure of which is incorporated herein by reference. Step (c). A solution of compound (1b) (ca. 7.5 mmol) in 10 mL acetonitrile was added over a 2 minutes period to a stirred clean solution of compound 4 (3.46 g; 8 mmol) in 300 ml acetonitrile at room temperature. The mixture was then stirred at room temperature for 24 hours. TLC analysis of the mixture was performed after 24 hours. The mixture was allowed to be stirred for additional 14 hours to a total of 38 hours. The mixture was concentrated and washed with 50 mL of 1N NaHCO3 eq. and 100 mL of ethyl acetate. The organic layer was separated, washed further with 1 N NaHCO3 eq. (1×10 mL), dried (Na2SO4), and filtered, to give a white solid powder, which was dried on vacuum for 5 hours and gave 2.54 g.
Example 2 was prepared according to Scheme 4. 2-(2-pyridyldithio)ethanol hydrochloride (compound (1b); 8.8 g; 39.33 mL) was dissolved in 78 mL CH2Cl2, and 2 eqs. 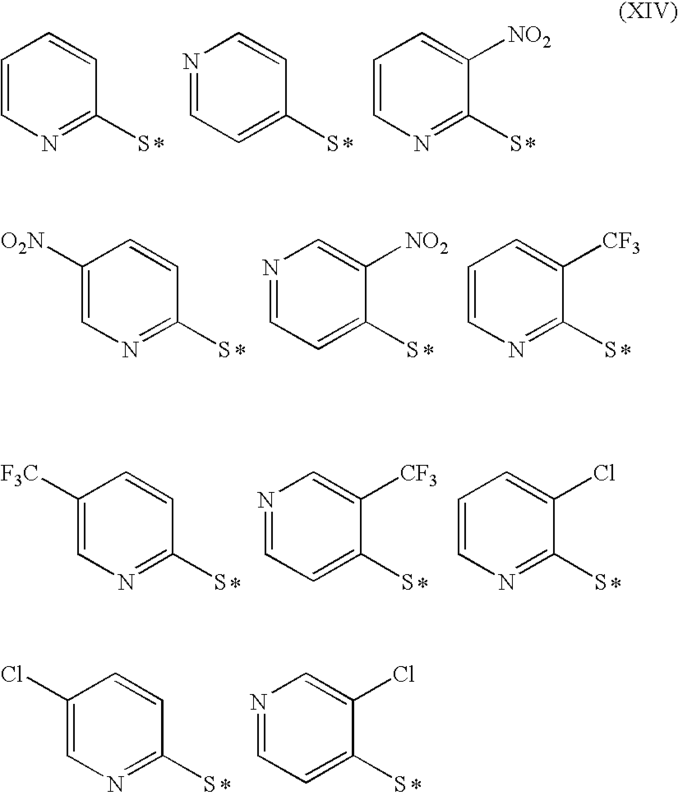 of pyridine (C5H5N; 80.88 mL) was added. para-Nitrophenyl chloroformate (compound (6); 8.08 g; 40 mmol) was dissolved in 80 mL CH2Cl2, and the solution was added to mixture of 2-(2-pyridyldithio)ethanol hydrochloride and pyridine over a 15 minutes period. The resultant clear solution was stirred at room temperature for 15 hours. TLC analysis for the above mixture after 15 hours stirring indicated completion of the reaction. The mixture was then filtered to remove precipitated pyridine hydrochloride. The light yellow clear filtrate was washed with deionized water (2×50 mL) to remove the dissolved pyridine hydrochloride, dried (Na2SO4), filtered, and concentrated with vacuum (13.8 g). Silica gel 60 (250 g) in CH2Cl2 was used to from a 50 cm×4.2 cm of silica gel bed with 250 mL solvent reservoir. The product compound (7), ca. 13.8 g, was dissolved in 15 mL (10 mL+5 mL) of CH2Cl2 and the solution was loaded with an elution ratio of 30 mL/min with standard collection of 30 mL fractions coupled with UV-detection and gave 13.3 g (96% yield). Example 3 was prepared according to Scheme 5. 3-Nitro-2-pyridinesulfenyl chloride (compound (8)) was dissolved in 15 mL anhydrous CH2Cl2. The solution was cooled by an ice bath. 4-ethanoyl thiophenol (compound (9)) was dissolved in 10 mL CH2Cl2 and added to a dropping funnel affixed to the container containing 3-nitro-2-pyridinesulfenyl chloride solution. 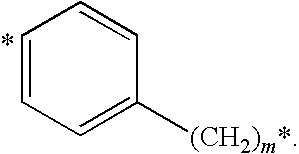 The solution of 4-ethanoyl thiophenol was added over a 2 to 5 minute period. After the solution of 4-ethanoyl thiophenol was added, the mixture was allowed to warm to room temperature and then stirred for 2 hours. While addition of 4-ethanoyl thiophenol, a precipitate formed. After the 2 hours period of stirring at room temperature was completed, the mixture was sonicated for 5 minutes and the precipitate dissolved. TLC analysis showed a new spot formed in addition to 3-nitro-2-pyridinesulfenyl chloride and 4-ethanoyl thiophenol. The reaction mixture was washed with saturated NaHCO3. The organic layer was supplemented with an addition 100 mL Ch2Cl2. The product was dried for 3 hours under vacuum. Example 4 was prepared according to Scheme 6. Compound (10) (0.025 g; 0.085 mmol) was dissolved in anhydrous CH2Cl2 under stirring. para-Nitrophenyl cholorofomate (compound (11); 0.020 g; 1.2 eq.) was added along with 1 eq. 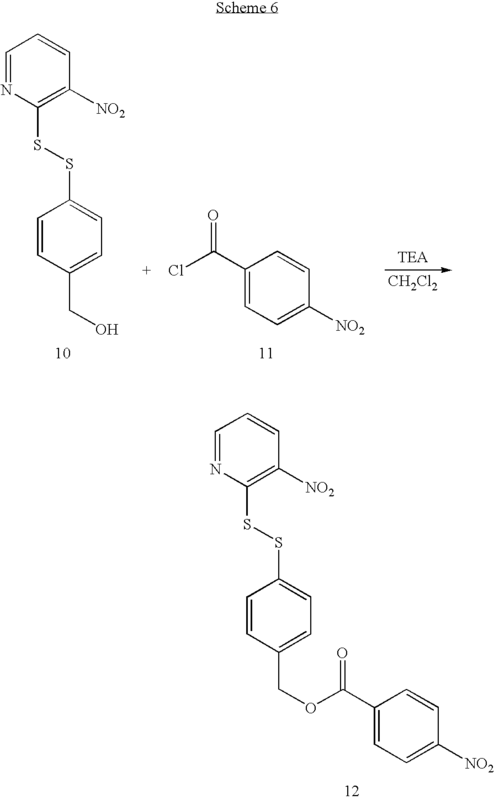 of triethylamine (TEA) to the stirring solution. TLC analysis showed that compound (10) was consumed after 2 hours. The product compound (12) was isolated by column chromatography (7:3 Hexane:EtOAc). Any of thiosulfonates (13) (1 eq. ), prepared according to the method of Ranasinghe and Fuchs, Synth. Commun. 18(3), 227-32 (1988), the disclosure of which is incorporated herein by reference, are reacted with drugs, drug analogs, or drug derivatives (14) (1 eq.) to prepare the drug thiosulfonates (15) as a solution in methanol, as shown in Scheme 7. Referring to Scheme 7, R is alkyl or aryl, L is a suitable leaving group, such as halogen, pentafluorophenyl, and the like, n is an integer from 1 to about 4, and X is —O—, —NH—, —C(O)O—, or —C(O)NH—. Conversion is conveniently monitored by observing the disappearance of each starting material by TLC (silica gel; CHCl3/MeOH=9/1). Final yield was 83% (mass of removed product was 32 mg from a total yield of 38.9 mg). 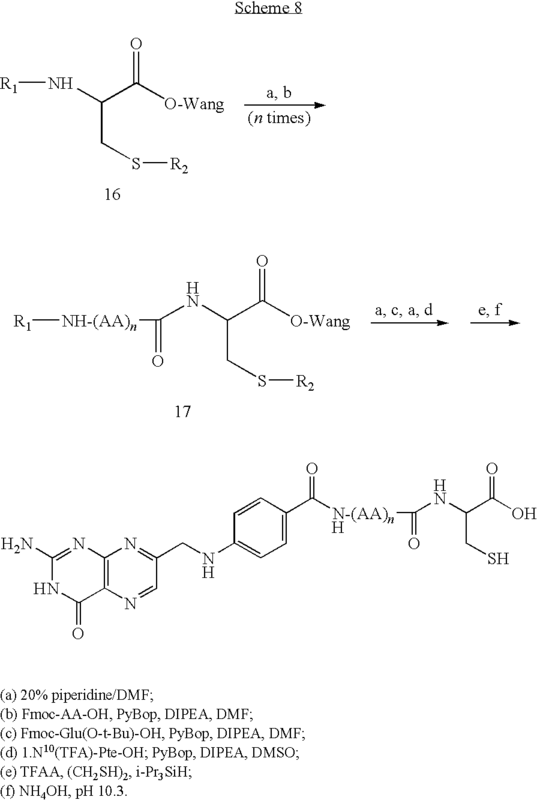 The folate-containing peptidyl fragment Pte-Glu-(AA)n-Cys-OH (18) is prepared by a polymer-supported sequential approach using the Fmoc-strategy on an acid-sensitive Fmoc-Cys(Trt)-Wang resin (16), as shown in Scheme 8. Referring to Scheme 8, R1 is Fmoc, R2 is Trityl, and DIPEA is diisopropylethylamine. PyBop is applied as the activating reagent to ensure efficient coupling. Fmoc protecting groups are removed after each coupling step under standard conditions. Appropriately protected amino acid building blocks, such as Fmoc-Glu-OtBu, N10-TFA-Pte-OH, and the like, are used, as described in Scheme 8, and represented by in step (b) by Fmoc-AA-OH. Thus, AA refers to any amino acid starting material, that is appropriatedly protected. The coupling sequence (steps (a) & (b)) involving Fmoc-AA-OH is performed “n” times to prepare solid-supported peptide (17), where n is an integer and may equal 0 to about 100. Following the last coupling step, the remaining Fmoc group is removed, and the peptide is sequentially coupled to a glutamate derivative (step (c)), deprotected, and coupled to TFA-protected pteroic acid (step (d)). 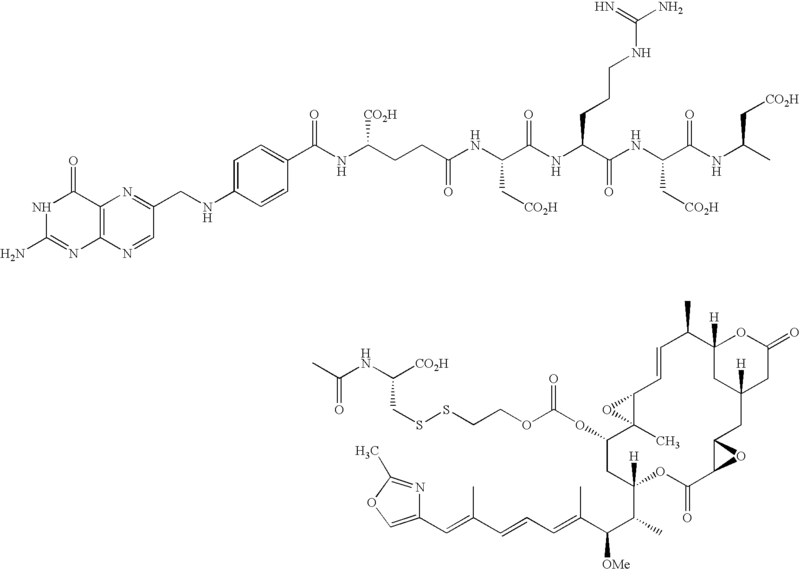 Subsequently, the peptide is cleaved from the polymeric support upon treatment with trifluoroacetic acid, ethanedithiol, and triisopropylsilane (step (e)). These reaction conditions result in the simultaneous removal of the t-Bu, t-Boc, and Trt protecting groups. The TFA protecting group is removed upon treatment with base (step (f)) to provide the folate-containing Cys-containing peptidyl fragment (18). Drug conjugates are prepared by reacting folate derivative (18) (0.9-0.95 eq.) with drug thiosulfonate (15) in deionized water (0.04 M, pH adjusted to 7 with 0.1 N NaHCO3) under argon for about 30 minutes, forming a disulfide bond. Upon evaporation of the methanol in vacuo, the conjugate may be purified by preparative HPLC (Prep Novapak HR C18 19×300 mM column; mobile phase (A)-1.0 mM phosphate buffer, pH=6; organic phase (B)-acetonitrile; conditions-gradient from 99% A and 1% B to 50% A and 50% B in 30 minutes, flow rate=15 mL/minute). Examples 6a-6f were prepared by the following general procedure. To a well stirred solution of the corresponding drug having an —OH group (1 eq. in dry CH2Cl2 or dry THF) was added under argon 6-(trifluoromethyl)benzotriazolyl 2-(2′-pyridyldithioethyl carbonate (1.3 eq.) and N,N-dimethylaminopyridine (1.5 eq.). The reaction mixture was stirred for 3 h, and the pyridyldithio-derivatized drug was isolated by silica chromatography (>65% for each example). 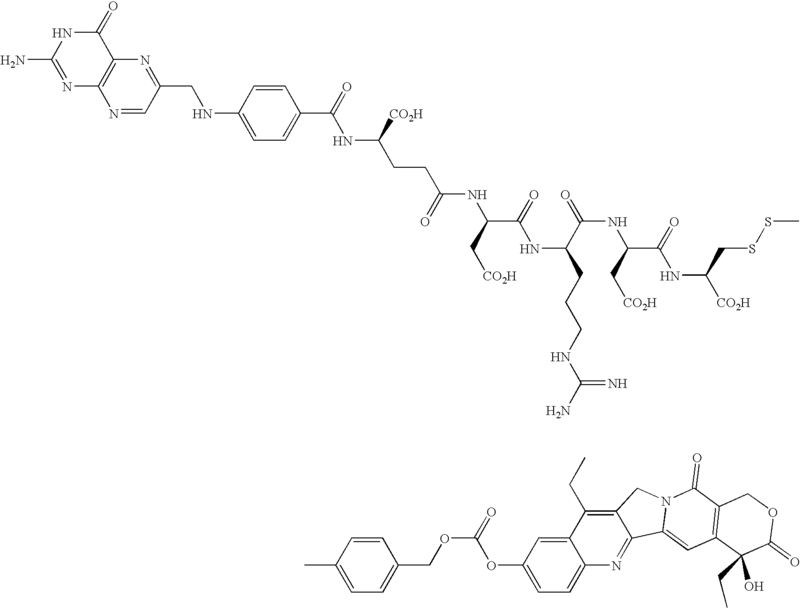 The corresponding peptidyl fragment (0.5 eq. ), prepared according to the procedures described herein and alternatively by conventional procedures, such as those described in U.S. Patent Application Publication No. US-2005-0002942-A1, was dissolved in DMSO. To the resulting clear yellow solution was added the pyridyl-dithio derivatized drug. After 30 min, the reaction was completed and the conjugate purified by HPLC. In the case of Example 6e, the peptidyl fragment Pte-Glu-Asp-Arg-Asp-Asp-Cys-OH was first dissolved in water, and the pH of the solution was adjusted to 2.5 with 0.1 N HCl, causing the peptidyl fragment to precipitate. The peptidyl fragment was collected by centrifugation, dried, and dissolved in DMSO for subsequent reaction with the pyridyldithio-derivatized drug. 1H NMR (DMSO-d6) δ 4.7 (d, 1H), 4.95 (t, 1H), 6.7 (d, 4H), 6.9 (t, 1H), 7.95 (d, 2H), 8.1 (d, 2H), 8.2 (m, 1H), 8.3 (s, 1H), 8.4 (s, 1H), 8.7 (s, 1H), 10.2 (s, 1H), 11.8 (d, 2H). ES MS (m−H)− 1436.4, (m+H)+ 1438.3. 1H NMR (DMSO-d6/D2O) δ 1.0 (s, 1H), 1.1 (s, 1H), 1.6 (s, 1H), 1.8 (s, 1H), 2.1 (s, 1H), 2.25 (s, 3H), 2.65 (dd, 2H), 3.7 (d, 1H), 4.4 (t, 1H), 4.55 (q, 2H), 4.6 (d, 2H), 4.95 (d, 1H), 5.9 (t, 1H), 6.15 (s, 1H), 6.6 (d, 2H), 7.85 (d, 2H), 7.95 (d, 2H), 8.6 (s, 1H), 8.95 (d, 1H). 1H NMR (DMSO-d6/D2O) δ 1.0 (s, 1H), 1.1 (s, 1H), 1.65 (s, 1H), 2.1 (s, 1H), 2.25 (s, 3H), 2.6 (dd, 2H), 3.25 (dd, 1H), 3.6 (t, 2H), 3.7 (d, 1H), 4.4 (t, 1H), 4.6 (d, 1H), 4.95 (d, 1H), 5.9 (t, 1H), 6.2 (s, 1H), 6.6 (d, 2H), 7.7 (t, 1H), 7.9 (d, 2H), 7.95 (d, 2H), 8.6 (s, 1H), 9.1 (d, 2H). 1H NMR (DMSO-d6/D2O) δ 10.85 (d, 2H), 1.05 (d, 2H), 1.2 (d, 2H), 1.7 (d, 2H), 3.95 (d, 1H), 4.05 (dd, 1H), 5.4 (dd, 1H), 5.7 (dd, 1H), 6.65 (d, 2H), 7.6 (d, 2H), 7.95 (s, 1H), 8.65 (s, 1H). ES MS (m+H)+ 1487.23; 1H NMR (DMSO-d6/D2O) δ 0.9 (t, 2H), 1.3 (t, 2H), 2.15 (t, 2H), 3.2 (dd, 1H), 4.0 (t, 1H), 4.15 (q, 1H), 5.3 (s, 2H), 5.5 (s, 2H), 6.6 (d, 2H), 7.0 (s, 1H), 7.4 (m, 2H), 7.55 (d, 2H), 8.0 (d, 2H), 8.6 (s, 1H). The intermediate 4-(2-pyridinyldithio)benzylcarbonate of SN 38 (10-hydroxy-7-ethylcamptothecin) was prepared according to the procedure described by P. Senter et al., J. Org. Chem. 1990, 55, 2875, the disclosure of which is incorporated herein by reference. The peptidyl fragment Pte-Glu-Asp-Arg-Asp-Cys-OH, prepared as described herein, was dissolved in DMSO, and to the resulting clear yellow solution was added the pyridyl-dithio derivatized drug. After 30 min, the reaction was completed and the conjugate purified by HPLC; ES MS (m+H)+ 1425.38; 1H NMR (DMSO-d6/D2O) δ 0.9 (t), 1.15 (t), 3.9 (t), 4.0 (t), 4.25 (t), 5.1 (m), 5.2 (s), 5.4 (s), 6.55 (d), 7.25 (d), 7.35 (d), 7.5 (d), 7.9 (d), 8.55 (s). The compound of Example 8 was prepared from the peptidyl fragment Pte-Glu-Asp-Arg-Asp-Asp-Cys-OH, prepared according to the procedures described herein and alternatively by conventional procedures, such as those described in U.S. Patent Application Publication No. US-2005-0002942-A1. The peptidyl fragment also reacted with either the thiosulfonate or pyridyldithio-activated vinblastine to form Example 8. 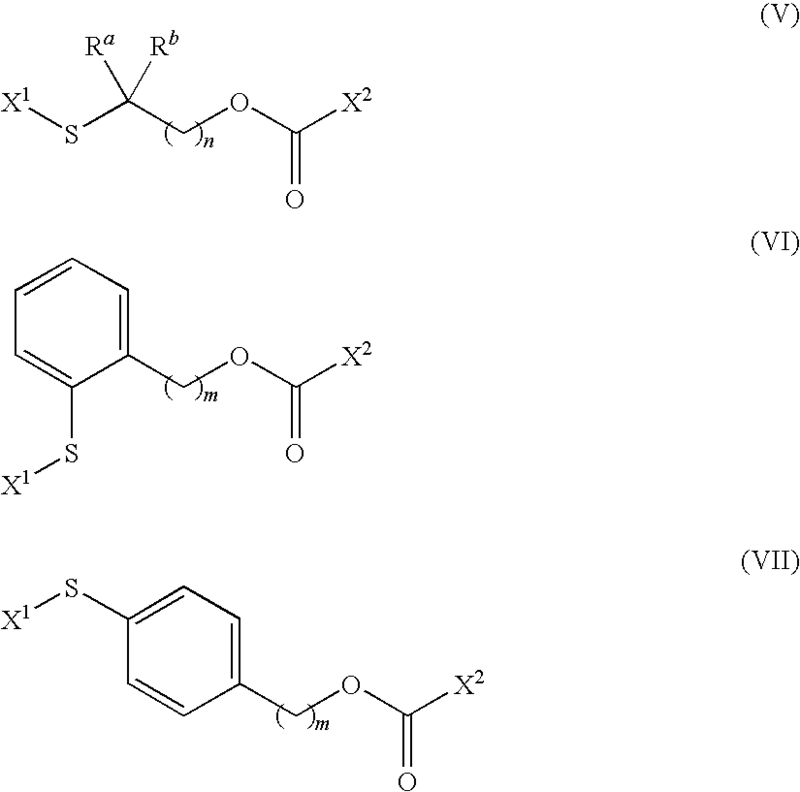 The pyridyldithio-activated vinblastine intermediates were prepared using the procedures described herein for other examples. The compounds of Examples 9-13 were prepared according to the procedures generally described herein, and were characterized by electrospray mass spectroscopy (ES MS), and other spectroscopic techniques, including 1D and 2D NMR, and UV, illustrative results of which are described herein. UV (nm) 233 (max), 255, 280; 1H NMR (D2O, NaOD, CD3CN) δ 1.15 (d, 3H), 2.3 (s, 3H), 3.6 (s, 1H), 3.85 (s, 3H), 4.9 (s, 1H), 5.3 (s, 1H), 6.5 (d, 2H), 7.3 (m, 1H), 7.5 (d, 2H), 7.65 (d, 2H), 8.4 (s, 1H). ES MS (m+H)+ 1382.3, (m+Na)+ 1405.4.
where R1 and R2 are each independently hydrogen or alkyl, such as methyl; and lH is a heteroatom, such as oxygen, sulfur, optionally substituted nitrogen, or optionally protected nitrogen, and the like. X2 is optionally substituted heteroaryloxy. 9. The compound of claim 8 wherein n is 1. 10. The compound of claim 8 wherein Ra and Rb are selected from the group consisting of hydrogen and lower alkyl. 11. The compound of claim 8 wherein Ra and Rb are each hydrogen. 12. The compound of claim 8 wherein Ra and Rb are taken together with the attached carbon atom to form a carbocyclic ring. 13. The compound of claim 8 wherein Ra and Rb are taken together with the attached carbon atom to form cyclopropyl. 15. The compound of claim 14 wherein m is 1. 17. The compound of claim 16 wherein m is 1. 18. The compound of claim 7 wherein the nucleophile is a drug, a vitamin, an imaging agent, a diagnostic agent, or another bivalent linker. 19. The compound of claim 7 wherein the X1 is optionally substituted heteroarylthio. 20. The compound of claim 7 wherein the X2 is optionally substituted benzotriazolyloxy. the process comprising the step of reacting a compound of the formula V-H with a compound of claim 1. 22. The process of claim 21 further comprising the step of adding a base. 23. 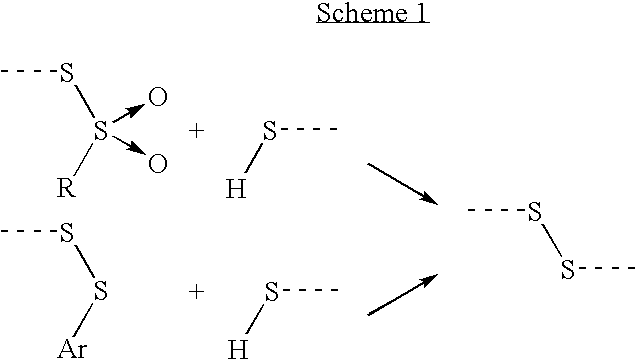 The process of claim 21 wherein V-H includes a thiol group, and the thiol group displaces X1 to form a disulfide bond. the process comprising the step of reacting a compound of the formula D-H, IA-H, or DA-H with a compound of claim 1. 25. The process of claim 24 further comprising the step of adding a base. 26. The process of claim 24 wherein D-H, IA-H, or DA-H includes a thiol group, and the thiol group displaces X1 to form a disulfide bond. the process comprising the step of reacting a compound of the formula V-L1-H with a compound of claim 1, where L1 comprises a fragment of L.
28. The process of claim 27 further comprising the step of adding a base. 29. The process of claim 27 wherein V-L1-H includes a thiol group, and the thiol group displaces X1 to form a disulfide bond. DE3750846D1 (en) 1986-08-29 1995-01-19 Kyowa Hakko Kogyo Kk Mitomycin derivatives. MX2013001402A (en) 2010-08-06 2013-08-29 Endocyte Inc Processes for preparing tubulysins. ES2215399T3 (en) 2004-10-01 Phenylxanthine derivatives. 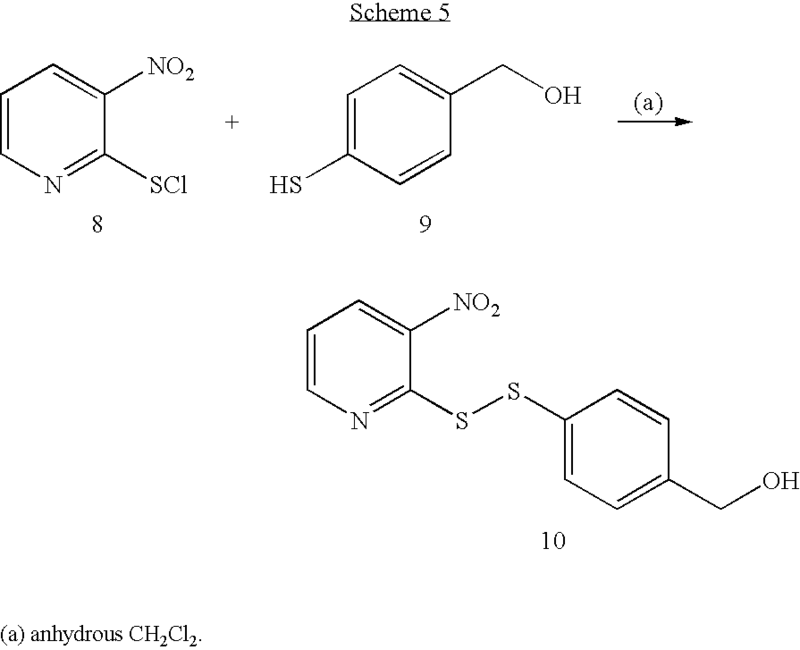 ES2269816T3 (en) 2007-04-01 -Thiophene and tiazolsulfonamidas as antineoplastic agents. 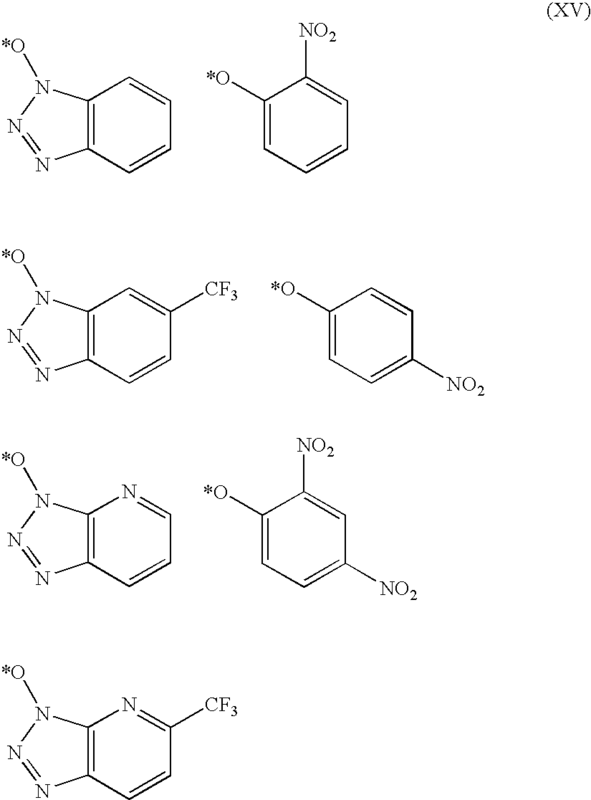 ES2263483T3 (en) 2006-12-16 2-arylbenzazole compounds substituted and their use as antitumor agents.